New In The Island Of Magic? 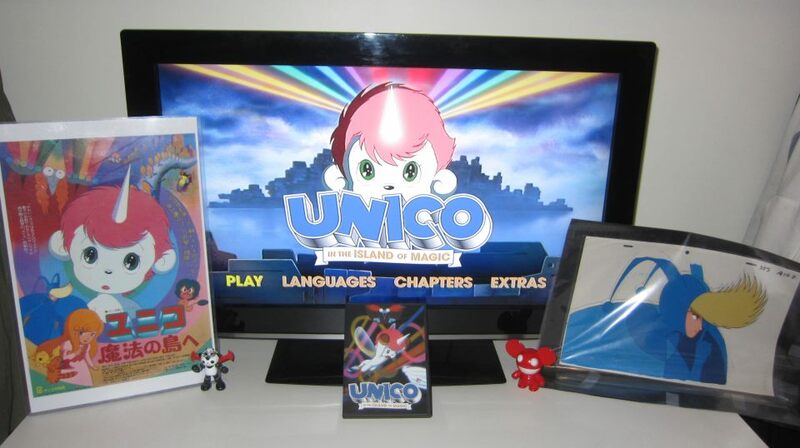 Well it's been over 6 years without updates, but I'm very VERY happy to say that for the first time ever, Unico In the Island of Magic is now commercially available on DVD! This will always be my favorite movie of all time, animated or otherwise. It's what got me into Japanese animation in the first place. To the left is a laminated promotional poster and to the right an actual original animation cel from the movie. The DVD has both English and Japanese voices as well as trailers and the pilot film. I couldn't be happier right now~! Get yours from Discotek Media Now! Added a little razzle-dazzle to the main page's look. Will fine tune it later for all of the other pages. Added "MySpace" Community to lists of discussion boards. Fixed the ullustrious Melvin line of mandolin picks. Its been a long Long time since the last update. Site was lost along with nearly a year of updates when the previous host dreamwater.org cancelled the unico account. This site remains the same as it was nearly 4 years ago but with a few additions. Don't expect updates anytime soon unfortunately. It will be restored with all missing files complete. Thank you for understanding! Happy Birthday website! Heh, my birthday in 12 days too. Site has been up for officially 1 year! to Celebrate I have added the Cosplay and Art Book sections. The site made Yam's Top Ten Unico Sites. Only ranked #3 but, hey! thats my favorite number anyway! ^_^ New plans for the coming year? umm MP3s of the songs, and more art. Thanks everyone for your support of this site. Site wins Cherry Unico's Unico Award! AboutMe page is updated. Unico: Cloud And White Feather (the pilot episode never translated to English) was recently put on EBay, I hope I win it! Also possible plans to put Unico movies on CD. Fixed some broken images. I plan on adding an Image Gallery soon. Theme song to the second movie! Also, Melvin's name in the Japanese version is "Yama Neko" translating to "Mountain Cat!". Cool, ne? Thanks so much to C-Chan for translation! Just went to Dragon*Con 2000! Great Convention for Sci-Fi/RPG fans. Its not an Anime con, but a great con neverless. My friend who said she was making a Unico costume has put the project on hold for awhile so it might not be finished by this year's AWA. She's been backed up by work and such, but she still plans on making one soon. Goody! I'll try and get the 2nd movie Art Book scanned soon. I also added some lyrics to the 2nd movie's Ending them song (Japanese version only). Enjoy! New! Fanart by purplecow102766! Go and see! Ok, ok the sound file is Finally fixed, as well as several "missing" image files. Corrected some links and changed a few minor glitches. Will be adding scans of the Unico Manga as soon as possible. Stay tuned! Finally! Its been a long while, and I'm back from Boot Camp. To celebrate a few friends of mine took me to A-kon 11. While there I picked up a RARE Unico Manga! Yay! I'll try and get scans up soon. Thanks to everyone for letting me know of broken links and the missing sound file. I'll try and fix these as soon as possible..
Site has now moved. You get a little banner at the top now. Otherwise, nothing much has changed. Merry Christmas/ Happy Chanukah everyone! The Unico Discussion list has now movied to EGroups. Be sure to join, as theres always something interesting to talk about. The page can be found here. Missing lines from the script are now complete. A Big thank you to Erika! Script is complete! All colours are assembled, go and see! On page six now of the script. Corrected spelling errors and redid some colours. Will be finished with entire script this week. Began on the script. Colour-coding it so its really easy to tell who is speaking. Right now, page 1 is complete. The rest have to be touched up some. Typed up the entire script (YES! The Entire movie) of Unico In The Island Of Magic. I plan to put it all in an illustrated novel form. I have the images, now to work on the layout. Corrected some spelling of the Japanese episodes. This week a new section- Roller Dragon. After noticing several differences, I've decided to give everyone's favorite (well only) Roller Dragon a section of his own. Added more information on the first Unico movie, Japanese version of course. Did I mention my site is now on Anipike with the rest of the other Unico links? I'm happy! Joined a Bunch of WebRings...this site needs more traffic. Also added 1 and only 1 new sound for those of you dying to hear Torupi converse with Kuruku-sama ^_^. Added Buddhist Influence section. Added great pictures to go along with the synopsis. Thanks Patrick! Touched up on My History and Japanese sections. Will eventually get direct laguage comparisons...no promises though ^_^! Just got back from Anime Weekend Atlanta 5. A Japanese Animation convention held in Georgia. Had a great time. If you're interested I made a site on it. Check it out here. I got Unico Japanese! Now to make some sound files ^_^, no luck on Unico pilot unfortunately. Made About Me page. Very informative if you're wondering who made this incredible page! Site wins the Award Of Elite Greatness! Made a little animated demon picture on the main page! Just got Final Fantasy 8...in English! Its taking up 98% of my time lately. Added Fan Art section. Put up another WebRing and soon will organize the Humor section. Its my Birthday! Wahoo! Guess how old I am? Heh. Added Japanese section and Availability. Just watched the Pokemon Movie: "Mewtwo Strikes Back"...Excellent! Perfected the Links section. Remember those broken links? Well I fixed them. Added Webrings and Links as well. Touched up on Characters. Also added on more sections. Added My History. Still working on guestbook. Finally getting something done on the page. All of my images are stored on Xoom, so I plan to just use certain ones as opposed to my original idea of using all of them.